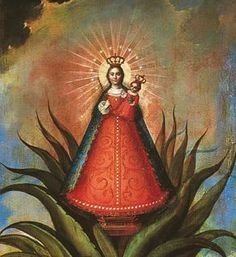 During the war for Independence from Spain the insurgents from San Miguel chose the image of Our Lady of Guadalupe (that Fr. 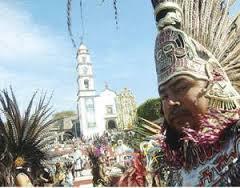 Hidalgo plucked from Atotonilco) to show how God’s mother was on their side. Did you know the Spanish side had their own Mary supporting them too? During a later battle in this area, the Spanish reported seeing a young girl throwing dirt into the eyes of the Aztecs to help the Spanish. As such this image of the Virgin is considered to be Spanish and a patroness to them and to the indigenous who adopted Spanish ways. A pilgrimage from SMA to a church in her honor in Comonfort starts several days of celebrations. Pilgrims normally leave around 7AM and arrive around 1PM so it is one of less strenuous pilgrimages from SMA. The church in Commonfort sits alongside the railroad and features an ornate altar with the small Mary front and center.